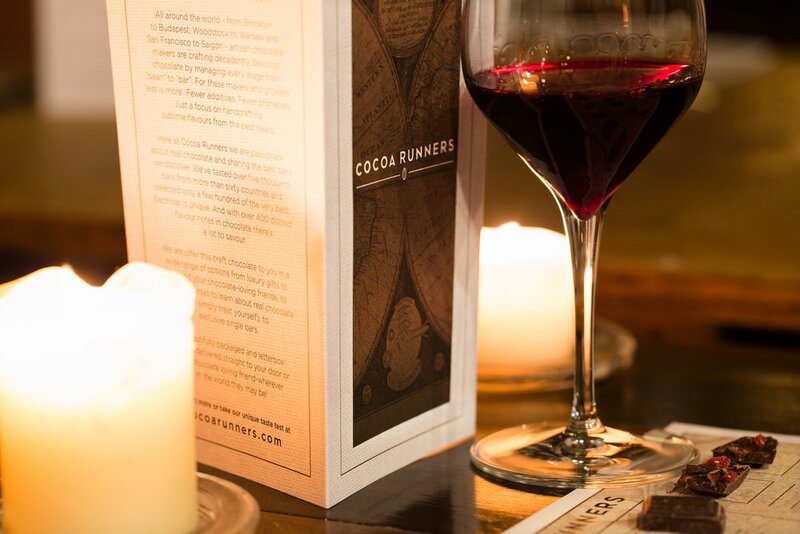 We've teamed up with craft chocolate experts Cocoa Runners to bring you a tasting simply not to be missed! There are many parallels between great wine and craft chocolate, so in this fun and informal two-hour tasting session, you'll taste for yourself how quality ingredients and their origin, artisan craft, passion and care make such a remarkable difference to both. You'll discover the similarities in producing wine and craft chocolate, learn a little wine and chocolate history along the way, plus we'll give lots of helpful hints and tips along the way on how to buy, what to look out for and avoid, pairing techniques and more. Guests will taste a minimum of ten amazing craft chocolates in an array of different styles, with bars made in places as close to us as Sussex to as far afield as Iceland and Thailand - each sampled with a delicious wine to help find a favourite matching or contrasting pairing. We guarantee to raise a smile and change the way you think about chocolate and wine forever. Cocoa Runners really do 'know their beans'(!) and have built a very strong reputation in the press for their fantastic range of artisan chocolates, and have been named as one of the UK's top 10 food subscription services.